Couple tried to stop bulldozer from destroying church building. (Morning Star News) – A government-backed demolition team in Henan Province, China last week buried a Christian couple alive as they tried to protect their church building, killing the wife, according to China Aid. Ding Cuimei and her husband, Li Jiangong, on Thursday (April 14) stepped in front of a bulldozer the demolition company had sent to destroy Beitou Church in Zhumadian in order for an area business interest to take over the property, according to China Aid. “Though the church leader managed to escape, the wife had suffocated to death by the time she was freed,” China Aid’s Bob Fu said in a press statement. Fu said one member of the two-member crew was heard to say, “Bury them alive for me. 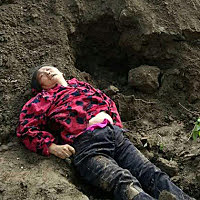 I will be responsible for their lives,” and then the bulldozer sent Ding and Li into a pit and covered them over with soil. Li was able to dig his way free, while Ding suffocated. Local police said the two crew members had been detained while a criminal investigation team from the public security bureau looked into the incident, according to China Aid. Area Christians told China Aid that various area government departments declined to oversee the demolition, and that Li said police were uncommonly slow to arrive after a report of the murder was filed. Government personnel are pressuring Li to suppress facts of the incident, according to China Aid.